2nd the Best: Look What I Made! I am doing a little western/farm/cowboy theme in my class this year. Nothing over the top, I just wanted a theme to use for my newsletter, AR board, Library, etc. I couldn't find any nameplates I liked, but I found an adorable digital scrapbook set at DesignerDigitals.com. 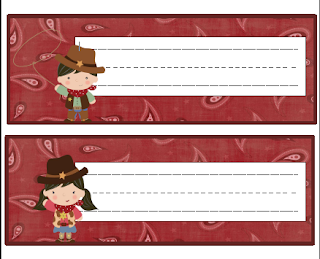 The western set I got was designed by Mindy Terasawa, and is so adorable. I can see this theme getting a bit carried away, but I am going to try and have a little self control. I am just having so much fun with it. I made these nameplates..I love them even though they will use up all my ink to print...oh well! If you want a set of your own, click on the picture and download them at Google Docs. I'm so excited to use them! Every year my school does a back to school BBQ the night before school starts. The kids get to find out who their new teacher will be and see their classroom. This year I'm going to have a little welcome gift on each students desk...just some pencils, erasers, etc....so I made these cute tags to tie to each gift. I hope my students love them as much as I do. Check them out at Google Docs.